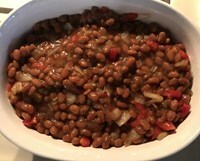 Sweet Baked Beans w/ brown sugar, sweet red peppers, and sweet onions. These sweet baked beans made with brown sugar, sweet peppers and onions are super tasty, and can make a great side to compliment all sorts of meals, like hamburgers, hot dogs, fried chicken and more! 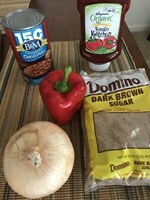 Here's how to make sweet baked beans with brown sugar. This recipe serves about 6 to 7 people. Dice the onion, and then heat in a pan to camelize the onions. If Brown Sugar is hard chunks, you can add the brown sugar to the pan with the onions to soften/liquify the sugar. In a mixing bowl, add 30oz. of Baked Beans, the diced Red Pepper, the onions, the brown sugar, and 2 TBsp of Ketchup, and then use a spoon to mix ingredients together. Pour mixed into a baking dish approx. 9" x 7" (CorningWare Oval Casserole Dish).